Last updated: March 6, 2014. GNU 3DLDF is a package for three-dimensional drawing with MetaPost output. Alternatively, http://ftpmirror.gnu.org/3dldf/ will automatically redirect to a nearby mirror. This is the first release since 1.1.5.1 in 2004. It is also the first release including the interactive program `3dldf', which implements a language intended to resemble Donald Knuth's METAFONT language and John Hobby's MetaPost language, which is based on METAFONT. In previous releases, the GNU 3DLDF package was more like a library of C++ classes and functions which could be used by users to write programs for making drawings. For several years, versions of the package allowing interactive use have been available via Savannah, but 2.0 is the first official release including this feature. There have been many other changes, too numerous to list here. This release has been delayed so long, because the change in the way the package is meant to be used (i.e., interactively) means that the manual must be completely rewritten. Unfortunately, it has not been possible for me to do this. However, in order not to delay the release any longer, I have decided to go ahead without a new manual. As a partial substitute, many examples are included in the subdirectory 3DLDF-2.0/examples/. This news not old enough for you? Then try some Even Older News. The complete sources for GNU 3DLDF are available from the Git repository for the 3DLDF project on the GNU Project's software development site Savannah. The most recent version of the GNU 3DLDF manual (see below) documents Release 1.1.5.1. I need to rewrite it completely in order to account for the many changes I've made in my development versions. I have been documenting the latter on these web pages. The old manual may still be of use to people who want to know how 3DLDF is implemented, but it is quite out-of-date by now. I've abandoned work on the GNU 3DLDF 1.2.0 Manual --- Plain Text Version (Last updated 2005-01-31). I now plan to convert it to Texinfo. Until I do, however, it may still be useful to people who want to learn how to use 3DLDF 1.2.0. The downloadable versions of 3DLDF: The Program, and the versions in the distribution have the table of contents at the front. This is not the case, if you generate them yourself. In order to do this, I used dviselect and dviconcat. I have not yet written make rules to do have this done automatically. The 3DLDF User and Reference Manual, Edition 1.1.5.1, as an HTML document suitable for browsing, with one webpage per node. The 3DLDF User and Reference Manual , Edition 1.1.5.1, as an HTML document suitable for browsing, entirely on one webpage. The 3DLDF User and Reference Manual , Edition 1.1.5.1 in HTML format, with one webpage per node, as a compressed archive file (gzipped tar file) for downloading. The 3DLDF User and Reference Manual , Edition 1.1.5.1 in HTML format, entirely on one webpage, as a compressed (gzipped) file for downloading. The 3DLDF User and Reference Manual , Edition 1.1.5.1, as a compressed (gzipped) PostScript file for downloading. The 3DLDF User and Reference Manual , Edition 1.1.5.1, as a PDF (Portable Document Format) file for viewing on-line (if your browser has an appropriate plug-in). The 3DLDF User and Reference Manual , Edition 1.1.5.1, as a compressed (gzipped) PDF (Portable Document Format) file for downloading. 3DLDF: The Program for version 1.1.5.1 as a PDF file for viewing on-line (if your browser has an appropriate plug-in). 3DLDF: The Program for version 1.1.5.1 as a compressed (gzipped) PDF file for downloading. 3DLDF: The Program for version 1.1.5.1 as a compressed (gzipped) PostScript file for downloading. 3DLDF: The Program for version 1.1.5.1 as a compressed (gzipped) DVI file for downloading. The utility conveps is included in the GNU 3DLDF distribution. It is for converting the Encapsulated PostScript files generated by MetaPost to other formats. When the EPS files generated by MetaPost don't contain any TeX text, there's no problem converting them to other formats, so there's no need for a special utility. However, when they do, programs that convert one graphics file format to another can't handle them. conveps solves this problem by including the EPS files in TeX files, and running TeX, dvips, mogrify, and convert. The structured PostScript (PS) files produced by dvips namely can be converted to other formats. conveps.ps.gz — Compressed (gzipped) PostScript file. conveps.dvi.gz — Compressed (gzipped) DVI file. It's sometimes useful to convert TeX text into other formats, so that it can be displayed in a browser or combined with images created in some other way. ImageMagick's convert program can be used to convert the PostScript files generated from TeX text to other formats. 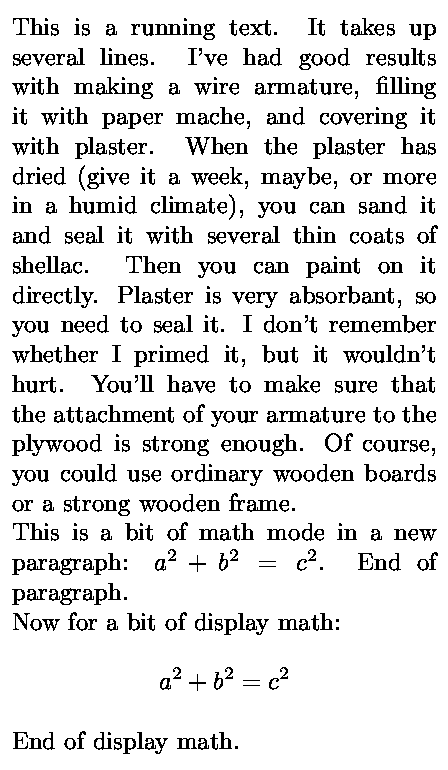 The file box_math.txt contains TeX code for making examples of this. (It's called box_math.txt so browsers will display it as an ASCII, i.e., plain text, file without complaining.) The version of this file included in the 3DLDF distribution may be found here: box_math.tex. The latter file may be more recent than the version on this web page. There are two basic ways of formatting text using the code in box_math.txt. The first way formats running text using a specified \hsize. In this case, TeX chooses the line breaks. The second way is for the user to specify the line breaks. In this case, the macro \boximage in box_math.txt chooses an \hsize large enough for the longest line. In the following examples, the frames aren't part of the images. I've added them to show the size of the images. It would be very tedious to type in the code for explicit line breaking for more than a couple of examples. Instead, the code in box_math.txt is intended to be used by a utility that generates images from TeX code and a few arguments for setting options. The macro \boximage puts the text into a \vbox and surrounds it with a red frame made up of \vrules. The top, bottom, left, and right margins between the frame and the block of text can be set by the user. After running tex and dvips, a PNG file (b.png) is created from the resulting PostScript file (b.ps) by the command convert -crop 0x0 +antialias -fill white -opaque "rgb(255,0,0)" b.ps b.png. The -crop 0x0 option removes the parts of the image that lie outside the frame. The -fill and -opaque options together change the color of the red frame to white. The +antialias option disables use of anti-aliasing, so that the color of pixels in the image are left unchanged. Without this option, the -fill and -opaque wouldn't be able to remove the red frame cleanly, because some of the red pixels would have been changed. If a frame is desired, the -fill and -opaque options can be omitted. The first argument to \boximage makes it possible to specify a different color for the frame, if the image contains red text. The color used for the frame shouldn't appear in the image. One problem with converting PostScript files created using TeX to images is the poor resolution and hence the poor appearance of such images when displayed in a browser. The relationship between image size and resolution is tricky. The fonts used for TeX are mostly available in small sizes for use on devices with relatively high resolution. Plain magnification doesn't produce good results, because single pixels are merely replaced by groups of pixels. I still have a lot to learn about the issues involved. 2005-05-02. I've replaced @ with -*-AT-*- in all of the email addresses on these webpages, and removed all clickable references to email addresses. I've been forced to this step by the huge amounts of spam I receive. I have reactivated the help-3dldf-*-AT-*-gnu.org mailing list, but only for subscribers. Postings from non-subscribers are automatically discarded. I have deactivated the other GNU 3DLDF mailing lists. I have been forced to take this step by the huge amounts of spam posted to these lists. For the same reason, I've also replaced @ with -*-AT-*- in all of the email addresses on these webpages, and removed all clickable references to email addresses. If would prefer that all queries and comments be addressed to help-3dldf-*-AT-*-gnu.org, but if you don't wish to subscribe, you may contact me directly. help-3dldf-*-AT-*-gnu.org for users to ask one another for help. Marc van Dongen's MetaPost Pages. L. Nobre G.'s MetaPost Pages. Anthony Phan's Web Pages (m3D). If you want to contact me about 3DLDF, please put 3DLDF , 3dldf or something similar in the subject line of your email. Otherwise, it's likely to be filtered. If you want to encrypt an email to me, you can use my public key .